The iPhone is great to check and send your emails wherever you are. Unfortunately, if you are using a normal SMTP server – the one that comes with your account on Gmail or Hotmail or Yahoo – you need to change its settings any time you switch to another internet connection. If you want to avoid this issue once for all you can opt for a professional SMTP service like turboSMTP: you’ll just need to configure our server’s settings once and it’ll work no matter which ISP you’re using; so it’s ideal if you’re travelling often and your eyes are always on your email account. 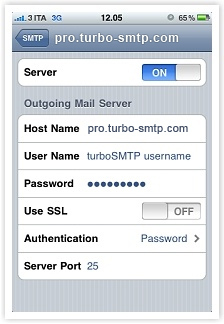 And here’s how to set up an SMTP for your iPhone. 1. 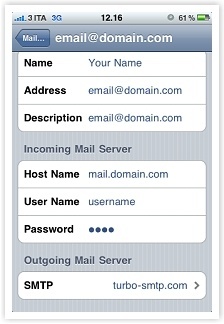 Tap “Settings > Mail, Contacts, Calendars”. 2. Tap the email account from which you want to send messages (or add a new one if it’s the case). Host name: your SMTP server’s name. If you don’t know it, have a look at our list of outgoing servers parameters. User name: your sending email address. Password: the password you chose.- Use SSL: set it off – unless you have enabled an SSL mode on your SMTP server. Authentication: tap on it and select “Password”; enter your password. Server Port: the default port is 25, but some ISPs block it due to the increasing amount of spam; so you can set another one. Tap “Done” and you’re ready to send emails!